"A genuine one-stop reference point for the many, many differing strands of cultural analysis. This isn't just one contender among many for the title of 'best multidisciplinary overview'; this is a true heavyweight." "An achievement and a delight - both compelling and useful." With the 'cultural turn', the concept of culture has assumed enormous importance in our understanding of the interrelations between social, political and economic structures, patterns of everyday interaction, and systems of meaning-making. 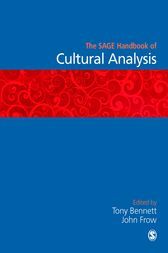 In The SAGE Handbook of Cultural Analysis, the leading figures in their fields explore the implications of this paradigm shift. Part I looks at the major disciplines of knowledge in the humanities and social sciences, asking how they have been reshaped by the cultural turn and how they have elaborated distinctive new objects of knowledge. Parts II and III examine the questions arising from a practice of analysis in which the researcher is drawn reflexively into the object of study and in which methodological frameworks are rarely given in advance. Addressed to academics and advanced students in all fields of the social sciences and humanities, The SAGE Handbook of Cultural Analysis is at once a synthesis of advances in the field, with a comprehensive coverage of the scholarly literature, and a collection of original and provocative essays by some of the brightest intellectuals of our time. Examining theoretical frameworks, policy issues, and research approaches, Bennett and Frow's pre-eminent collection robustly defends the importance of the 'cultural turn', and richly deserves attention and analysis in its own right. Taking in a far broader sweep than the allegiances of cultural studies, and ranging far wider than a focus on cultural theory alone, this Handbook offers a genuine one-stop reference point for the many, many differing strands of cultural analysis. This isn't just one contender among many for the title of 'best multidisciplinary overview'; this is a true heavyweight.